Ever dreamt of having a comforting and creamy soup to banish the winter cold in less than 5 minutes? Well, now it’s possible with this recipe for Pumpkin Bisque, which will barely take you any time to blend. Pumpkins are quite popular is several Indian cuisines for the lovely sweetness it lends to a dish once cooked to perfection. With added texture from toasted pumpkin seeds, this supremely autumnal dish is a great way to warm up. Serve it as a lunch, a light supper or part of a larger, festive meal, it fits in any occasion. 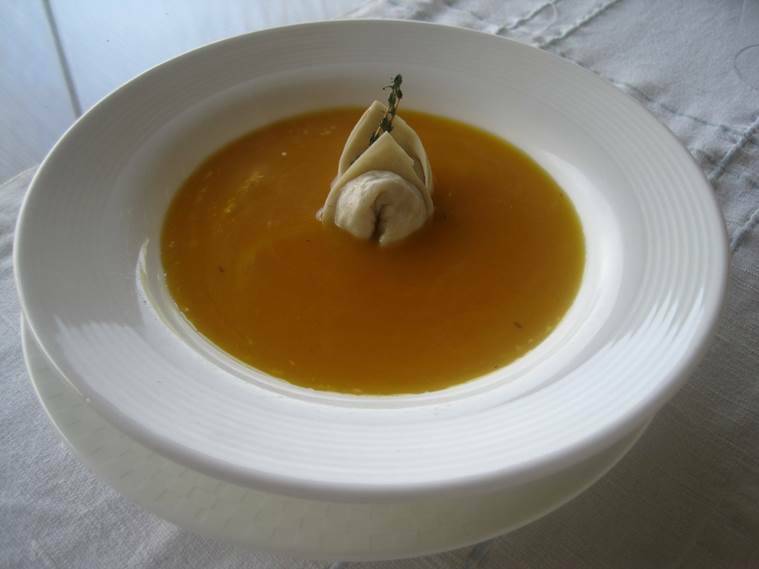 Get into the winter spirit with this Hand-pulled Pumpkin Bisque Soup recipe by Chef Sumalya Sarkar, executive chef, The Gateway Resort Damdama Lake, Gurgaon. * Preheat the oven at 180 degree Celsius. * Peel the pumpkin, cut, dice and marinate with garlic, thyme, salt, black pepper with olive oil. * Put the mixture in a roasting tray and roast for 15 minutes. * Prepare a pasta dough with flour, egg and salt. Cover with wet cloth and keep for rest the dough. * Prepare a purée of one-third of the mixture and rest will be roughly chopped for pasta stuffing. * Prepare the tortellini pasta with the filling of roasted pumpkin mixture. Toss it with olive oil and garlic. * In a sauce pan, heat the olive oil and saute the pumpkin mixture and add vegetable stock. * Adjust the seasoning with salt and pepper and finished with cream and butter. * Garnish it with cream and you ready to serve it with roasted pumpkin tortellini and a sprig of thyme.